Is it illegal to drink in public? Social drinking is a common aspect of socializing in south Louisiana. In Baton Rouge, students at the Tigerland bars and students and adults LSU football games, tailgating at football games, or attending Mardi Gras or St. Patrick’s Day parades are all likely to be drinking in public, with friends (and often family). Which is why getting a criminal citation for open container or other alcohol related charges is a lousy way to end a day of celebration. There is no statewide ban on persons over 21 years of age having an open alcoholic beverage in a public place, but there are statewide bans on persons under 21 years age having an open alcoholic beverage in a public place, or on any person, regardless of age, having an open alcoholic beverage in a vehicle operating on the road. There’s also a statewide disturbing the peace law, which includes public intoxication, and a law against criminal damage to property – a common side effect of public intoxication. The Baton Rouge Code of Ordinances does make it unlawful for people of any age to have open alcoholic beverages in public places, unless there’s a special exception, such as permits issued by the local alcohol board for particular festivals or events. Drivers and passengers are forbidden to have open alcoholic beverages on public roadways, whether they’re drinking or not, and whether they’re impaired or not. There are tales, maybe tall tales, of officers writing citations on drivers who have half-empty wine bottles in the back seat from a party the night before – and that would be a legitimate citation under pretty much all of the open container in vehicle laws. 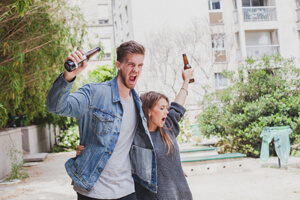 Depending on the jurisdiction, open containers may be allowed in public places for special events, in specific districts, or some combination of the two. Other jurisdictions still allow them, and the general rule is that it’s not an open container if it doesn’t have a straw punched through the lid, but most drive through daiquiri shops use tape to seal the lid to the cup, and cover the perforated area for the straw, so that their customers can readily show that the container is still sealed. It may or may not work, depending on the officer, the prosecutor, and/or judge, if a person were to be cited for open container in vehicle, especially if the driver and/or passengers smelled of alcohol. The best practice is to buy your daiquiris, put them in a cooler in the trunk, and drive home before drinking. New Orleans allows open containers of alcohol in the French Quarter, but only if the container is not made of glass or metal. The boundaries are confusing, so ask your bartender if you’re in an area where open containers are permitted. Underage possession of alcohol and disturbing the peace by intoxication are still against the law, regardless of what kind of container you’re using. In Baton Rouge, the penalties can be severe, even though they are all misdemeanors. Realistically, in Baton Rouge, simple open container in public, or minor in possession, is penalized with a fine, court costs, and going to a class, or maybe doing some community service, when the offender has not engaged in dangerous or particularly aggravating behavior. However, when there are fights, destruction of property, or antagonizing law enforcement along with the open containers, the penalties will tend to be more severe. The state law against having an open container in vehicle is more lenient – a fine not to exceed $100.00 plus court costs. Baton Rouge MIP lawyer Joseph Scott has handled hundreds of open container, and open container in vehicle charges as a prosecutor. Keeping your record clean, and minimizing the penalty for mistakes in judgment, are very important to you, and that’s why you need an attorney who knows the system from the inside out. Whether the answer is guiding a defendant through pretrial, negotiating better terms of diversion, quashing a citation and charges through motion work, or trying the case to a judge, Baton Rouge defense attorney Joseph Scott brings an aggressive defense, tempered by knowledge of how the enforcement agencies do their job.